Merry Christmas! We’re edging closer to 2015, but there’s still time for Frosty to get his party on. These Oreo snowmen are super easy to make, and always a safe bet at parties. Who doesn’t love a chocolate covered Oreo? Whether you’re in need of last minute stocking stuffers, or an unexpected party invitation, these are a foolproof treat anyone will love. 1. Gently poke a stick into the creme of your Oreo. If the cream layer is too thin, you could also twist off one side of the Oreo and use some of the candy melt or chocolate to stick it back together with the stick inside. Cut each Starburst diagonally in an X shape, from corner to corner, creating a triangle shape for the nose. 2. Melt the chocolate or candy melts according to the instructions. Pour the melted goo over the Oreo, being sure to coat all sides. I found pouring was easier than dipping. The melts seemed to pull the Oreo off the stick, but pouring the melt over the Oreo worked really well. 3. Set the covered Oreos on wax paper. Press the cut Starbursts into the melted coating. 4. 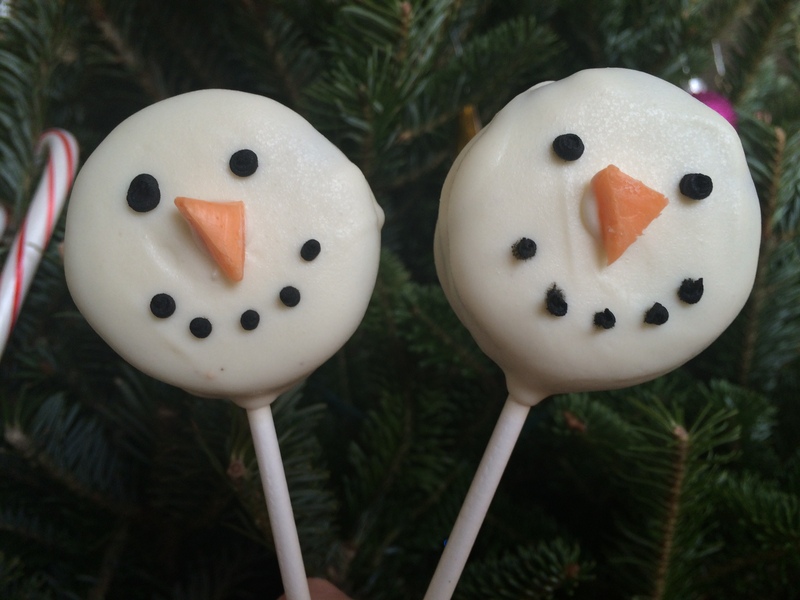 Once the melt is hard, draw eyes and a mouth onto the snowmen with black frosting. Let it set for a few minutes, then enjoy! This entry was posted in Uncategorized and tagged chocolate covered oreos, Christmas desserts, oreo pops, snowmen pops by theculinarycapers. Bookmark the permalink.